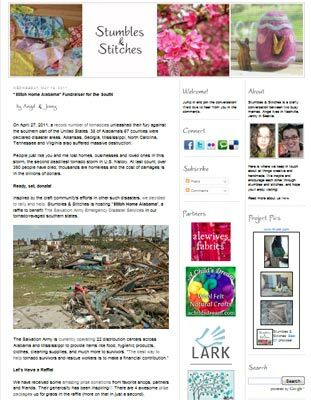 Angel and Jenny from Stumbles and Stitches are holding an on-line fund-raising raffle to support relief efforts for the devastating tornadoes that recently ravaged several states in the southern United States. You can see the prize packages and get all the details about how you can make your donation count at this page. Thank you so much for helping us spread the word (and for your contribution to the prizes!!). Thanks for the heads up. Donated. What a great idea for a fundraiser. That is so, so nice! I live in Alabama, very near to the affected areas and it is really just a lovely thing you are doing!